Summer months are super hot though, above 40°c. Access to the two pools. Lunch and the superb beach access included. The Resort Pass gives access to all the hotel facilities, recreation center, water sport complex and kilometer-long private beach, for a day of fun and relax in the scenic environment of the luxury property. The pass includes the following services: A sun lounge with water and towels, all-day access to the Al Bustan Palace facilities, fitness center and water sport complex. Additionally, adults and children alike are invited to take part in any of the resort’s daily scheduled complimentary activities conducted by the recreation team, such as circuit training, yoga, aqua dance, or a tennis cardio class with the resort’s PBI tennis coach. 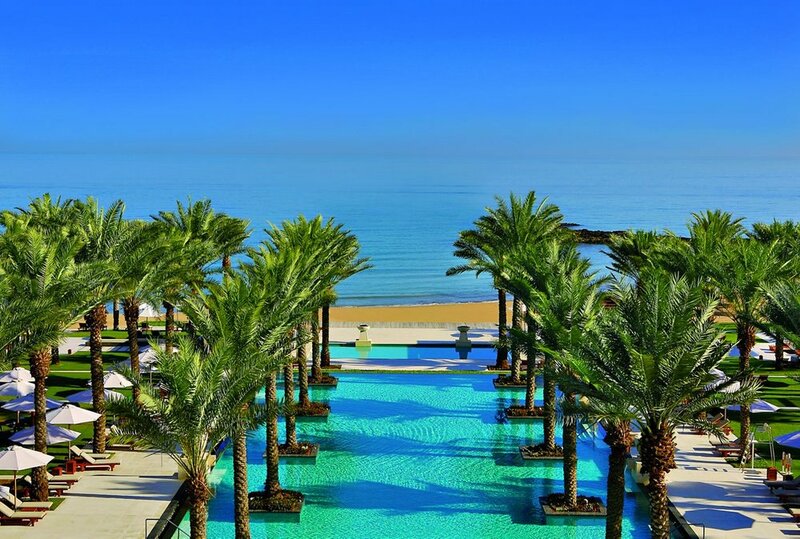 Surrounded by a lovely garden and palm trees, the Intercontinental Oman feels like you're on a private island. Wonderful pool right next to the beach. The Restaurant adjacent to the pool serves delicious Asian cuisine. Refurbished in 2016, it's all new, for your enjoyment only. 45mins drive away from Muscat, this might worth the drive to escape the city and plunge in a quiet and calm atmosphere. The Day Pass package includes lunch.